Is Your Life A Daring Adventure? Helen Keller was known to say that life can be a daring adventure or nothing at all. A very courageous outlook from someone who could so easily have claimed the role of being the victim of severe limitations. Her zest for seeking adventure in everything is a trait worth pursuing. I am currently in Northern California visiting my dearest long-time friend, Irene Hall. I dedicated my book, Creating a Haven of Peace to Irene and her husband, Jerry, who became our close friends back in the mid-70s when we all lived in Southern California. We worked together, cooked together, shared having babies together and developed a keen sense of adventure through our husbands. Keeping a humorous perspective helped us keep our sanity in the midst of continual change. Both our husbands embrace change like it is a lifeline. Back then they had no qualms about impulsively implementing a new business idea or stopping in the middle of chaos and confusion to take a trip to the dessert for a weekend of unwinding and fun. Life is a huge adventure for them. What’s to be conquered next? Irene and I, however, are realists by nature. We think we tether our guys back to reality when they get too grandiose in their adventure-seeking. When they are envisioning the future, we are wondering about the NOW. 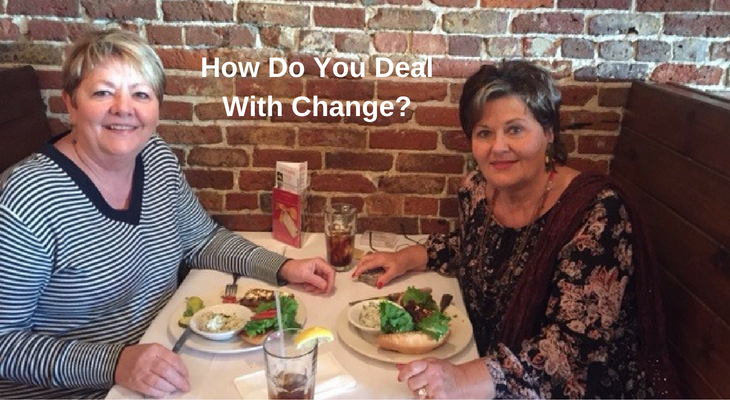 This week Irene and I are reminiscing and laughing about all the escapades our husbands led us into that sometimes drove us crazy but also helped us learn to embrace change in a way that has made our lives more abundantly exciting. C–Curiosity…a healthy curiosity helps you remain open to new options instead of getting bored or mired down with the status quo. H–Humor…keeping your sense of humor is essential to maintaining a great perspective when confronted with something new and different. Humor can replace anger and fear like no other emotion. A–Adventure…embracing adventure with anticipation rather than trepidation keeps life exciting and fulfilling. P–Possibility…asking yourself, “What does this make possible?” can lead you into areas you may never have thought to pursue if change hadn’t been thrust upon you. Irene and I have had lots of laughs remembering the many times we found our belongings stashed in a cardboard box because our favorite car had been sold out from under us. Or the time our spouses decided it would be a fun adventure to sell Christmas trees during the holiday, preventing us from attending any festivities because we worked ourselves silly while barely breaking even on the deal. Sometimes it was hard for us to embrace the changes as eloquently as we would have liked, but we came to believe, as Helen Keller believed….that life is either a daring adventure or nothing at all. And we learned to embrace the adventure rather than hang on to the past. We both believe it has made our lives more exciting than we could have possibly dreamed up on our own. Carpe Diem! Seize the day! How do you look at change? Do you find it an exciting adventure or fear the unknown? I’d love to hear. Hey I just signed us up for bungie jumping when you get back to Tennessee. Sounds like lots of fun – I’m confident you’ll enjoy it after the first big bounce. HA! No way! That’s way too adventurous for even me! ….I consider Jared and Ilea best friends…do I need to say more….one of my favorites is dashing through the narrow back streets of Mombasa …. So glad you have remained a part of their lives, Betty. Such a blessing! There is nothing better than lifelong friends! Enjoy and have a safe, wonderful trip! So glad you were able to spend some time with your BFF – I’ve always felt like she was just as much a family member as anyone else, even though I didn’t grow up with her close-by. I consider her a dear aunt due to your never-ending friendship over the years. And I love the adventures and am thrilled to be taking my own – the acronym is great! Thanks, Ashley. One thing I have learned over and over is that in the long scope of life, relationships trump everything. I take them very seriously.